We just got his handheld wireless milk frother and we love it!! My husband and I are big fans of going to coffee shops however they can get really expensive so sometimes it’s nice to just make some at home. 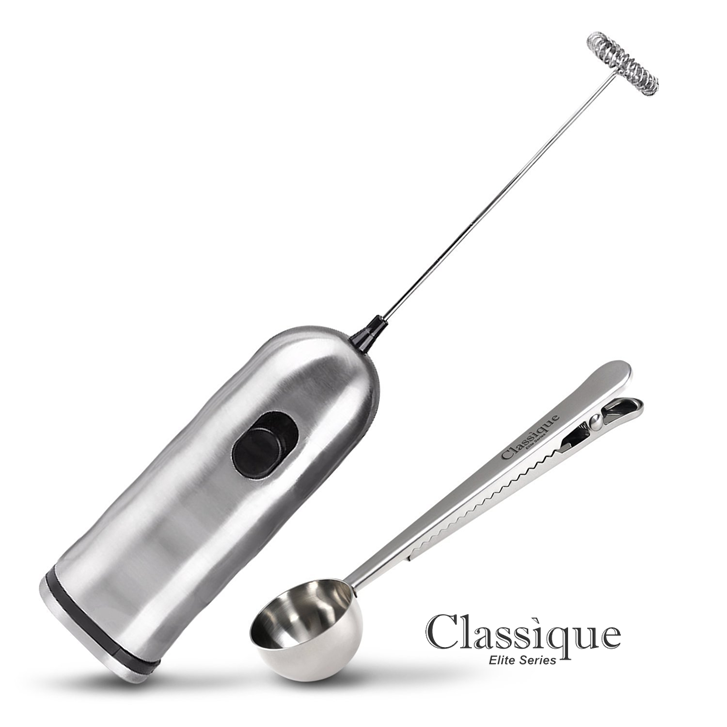 With the Classique handheld wireless milk frother we can make coffee house style drinks in the comfort of our own home really easily!! The frother is very lightweight and easy to use. It whips up gourmet style froth in minutes for not only coffee but lattes, cappucinos, hot chocolates, and more! It’s small enough that it stores easily and doesn’t take up much space. Only has one speed. It requires 2 AA batteries that are not included. As a bonus it comes with a coffee scoop and clip. I have never seen these before but it has a clip so you can roll the bag of coffee down and clip it to keep it fresh and a scoop on the other end to scoop out your coffee. Whip up gourmet sauces, powdered drinks, almond & soy milk, cream, eggs & coffee – Save money!